What is an Industrial Thin Client? Thin client computing is becoming an increasingly popular option for IT managers and integrators at both growing businesses and large corporations alike. A thin client network is composed of thin client PCs along with specialized management software and the server hardware on which all files, programs and applications are stored and maintained. But not all thin clients are created equal. For situations that require a more reliable hardware solution an industrial thin client is likely the best fit. Read on to find out why. What is a Thin Client? A thin client computer is a device without onboard storage designed to deliver programs and applications to the user from a centrally located terminal server. In contrast to the laborious task of maintaining a large deployment of individual terminal (desktop) PCs, thin clients allow for all program installation, patches and updates to be managed from the server and deployed as needed to the various thin clients on the network. 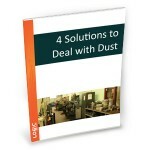 Click to download our guide to dealing with dust. Thin clients are designed to provide an inexpensive, easy to maintain alternative to traditional user terminal networks. However, many thin client computers suffer from the same performance challenges as their “fat client” counterparts. While most thin client computers are fanless, they may still rely on perforated enclosures to keep the system cool. In more challenging computing environments, like those often encountered in warehouse management and manufacturing applications, these standard thin client systems struggle to stand up to the prolonged exposure to airborne particulate that can collect on internal components and cause damage from shorting or overheating. Industrial thin clients are specifically engineered to resist dust and debris, as well as other environmental factors like extreme temperatures, shock and vibration, and feature fully fanless and ventless enclosures that protect internal components from damage while still keeping them cool. These rugged thin clients also feature specialized I/O for the various displays, peripherals and supporting equipment required in many commercial applications. What is a ThinManager-Ready® Thin Client? Systems certified as ThinManager Ready undergo rigorous testing by ACP to ensure optimal software performance. The ThinManager Ready designation helps ensure ThinManager users and integrators that their thin client hardware has been engineered to seamlessly interface with ThinManager networks. ACP maintains a full list of supported ThinManager hardware, however there’s an important distinction to be made between ThinManager Compatible systems and those certified as ThinManager Ready. Only ThinManager Ready computers have the appropriate ACP BIOS pre-loaded onto the device, enabling them to download the necessary firmware directly from ThinManager. ThinManager Compatible thin clients on the other hand do not store the necessary static IP addresses and require DHCP (Dynamic Host Configuration Protocol) in order to assign the client an IP address. Essentially, ThinManager Ready thin clients allow for a simpler, plug and play experience. The ThinManager Ready Logic Supply ML210G-10-TR combines the cost saving longevity and reliability of an industrial thin client with the proven efficiencies of ACP’s ThinManager platform. For questions about hardened thin client computing or to speak to one of our ThinManager specialists, contact us at +1 802 861 2300 or request a personalized consultation. What is an Embedded Computer? Brought to you by Logic Supply, The I/O HUB is your home for industrial and embedded computing news, information, industry trends and new product insights.